Photo Manipulation : Sebastian is a professional photographer and artist based in Zurich, Switzerland. His photography project titled 'underdogs' was started by him in the year 2009. 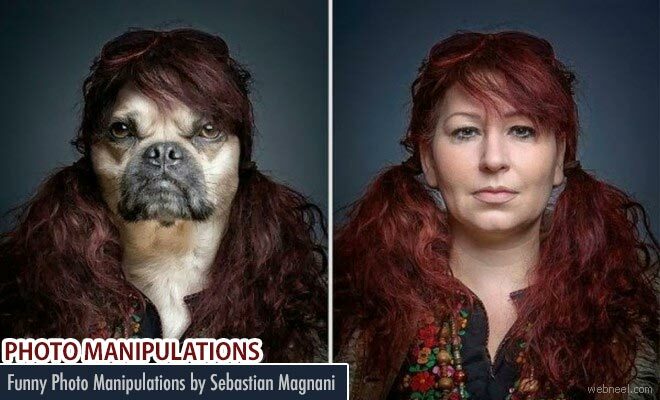 The crazy thought of humans with doggy faces turned true with digital photo manipulation with a couple of wigs, and viola: a human canine look-alike. These photographs are striking on their own besides bringing out the bonding between dog and its human friends. When asked about the project, Sebastoian said : It is undisputed that the canines not only stir emotions and interest, but also our inner most needs. Dogs are considered loyal, selfless, trustworthy, life saving, fun and proud companions in a world where these values are gradually disappearing.